Works great for LP audio capture. However, the app does not handle large mp3 files without giving a memory allocation error. The file was only 50MB. Also seems like the developers are not supporting the last version. This is a very good small and smart tool. It is fine that I can use VST machines - and there are good cost free VSTs out there. Does anyone know how you can redirect the recording to a different folder (possibly temporary on a hard drive) and disable the log file created at exit? Works well. Fast it ain't. This is a very nice sound editor. But it needs to be pointed out that while the application is less than 500 Kb, as soon as it starts recording the folder it's in grows very fast. About 30 seconds of silence equals close to a 10 Mb waveosaur.rec file, while it is recording. So it would be a good idea to leave some free space on your portable device if you plan on recording for very long. Nice, straight-forward sound editor. Does exactly what it says on the tin. A worthy addition to your portable apps USB key. if you don't have sound forge installed on your computer, this is a very worthy alternative! 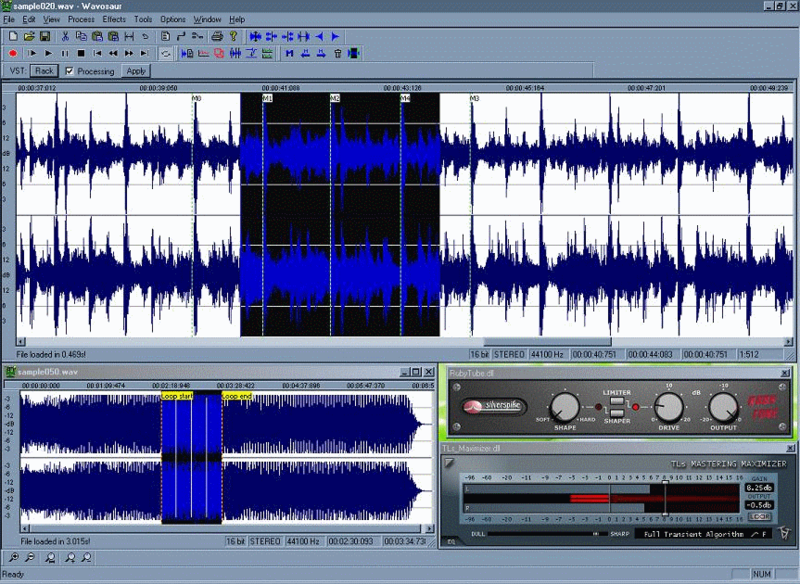 audacity is more like a multi-track sequencer, while wavosaur tries to emulate all of sound forge's functions. combined with ASIO4ALL, this is a very usable and handy app to add! Impressive software: only 400 Ko, no installer, no registry entry, and lot's of features for only... 0$.